Everything we’ve previously been taught about negotiation is wrong: you are not rational; there is no such thing as ‘fair’; compromise is the worst thing you can do; the real art of negotiation lies in mastering the intricacies of No, not Yes. These surprising tactics—which radically diverge from conventional negotiating strategy—weren’t cooked up in a classroom, but are the field-tested tools FBI agents used to talk criminals and hostage-takers around the world into (or out of) just about any scenario you can imagine. 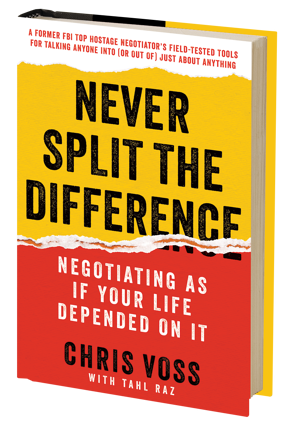 In NEVER SPLIT THE DIFFERENCE: Negotiating As If Your Life Depended On It, former FBI lead international kidnapping negotiator Chris Voss and co-author Tahl Raz break down these strategies so that anyone can use them in the workplace, in business, or at home. Throughout the book, Voss draws on his experiences in truly life-or-death situations to illustrate these techniques, and offers scores of examples of how they translate into our working lives. We spend most of our days at work negotiating for something. Knowing the most successful, crisis-tested approaches to the process will ensure the conversation more frequently goes your way. What sets these strategies apart from other negotiation paradigms—i.e., the standard thinking in negotiations is to approach them as logical and sequential problems to be solved—is the injection of emotional intelligence and empathy into the negotiation process. This was the game-changer for the FBI, Voss writes, and these are the unique skills emphasized in Never Split the Difference. Voss explains how simple these tools can be, such as your tone of voice, the types of questions you ask the other party, or even how you enter the conversation in the first place. Successfully asking for a raise, a new position, a client concession, or a change to the terms of a contract can all be influenced by the techniques outlined in the book. Voss was part of the generation that revolutionized and refined the FBI’s approach to the process of negotiation. And now he can help readers do the same in their own lives. “Former FBI Hostage Negotiator Chris Voss has few equals when it comes to high stakes negotiations. Whether for your business or your personal life, his techniques work.” —Joe Navarro, FBI Special Agent (Ret.) and author of the international bestseller, What Every BODY is Saying.